Airline travel has the allure of getting from A to B very quickly. The downside, which I always forget, is just how long it takes to get out of the airport and to where you want to be! By the magic of the international dateline we arrived, after 16 hours, at 12.30pm a mere 45 minutes after we departed. By the time we got to our hotel after getting lost, encountering both helpful and grumpy bus drivers, and settled in it was several hours later. Our hotel (The Metro) was fabulous and I cannot recommend it highly enough. Cheap, clean and friendly, it is located in Lower Haight, handy to the Mission District and the Castro. 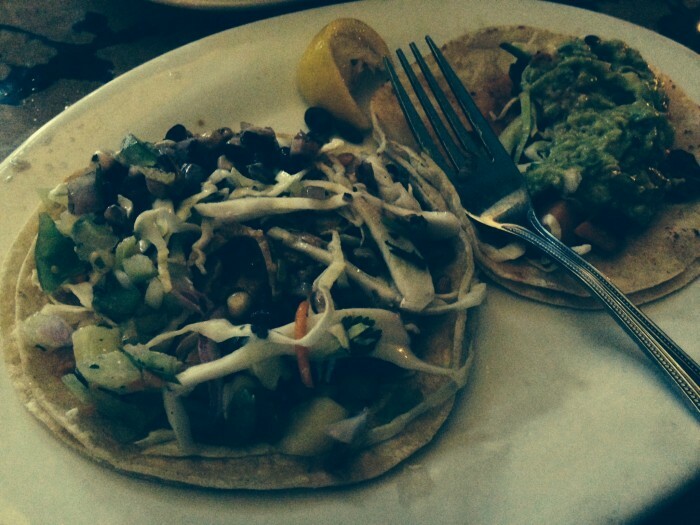 We headed off to Gracias Madre, a vegan Mexican restaurant in the Mission district. It was packed and there was an hour long wait to get in, so we settled for Weird Fish just up the street, a strange Mexican fish/vegan combination, good, but still we were left wanting to go to Gracias Madre which we had heard so many good things about. At Weird Fish we settled for some tacos and beer. There are lots of other vegan options on the menu including fish and chips. We wandered home by foot and bus through the mission, past bodegas, thrift stores, and beautiful multi-storey timber houses. So many contrasts, a mixture of hip gentrification and raw poverty, with shop front church services spilling out onto the footpaths. Everywhere the beautiful sound of Spanish being spoken. And at last, glorious sleep, after a long time without it.